Toward the end of February and the beginning of March—or when the first crow flies, as the Indians used to mark it—is the start of “sugar month” or “maple moon.” The frozen ground, usually still covered in snow, has just begun to thaw. Days are warming up but the nights return to bitter cold. No buds have popped their heads; the earth remains colorless. While the rest of us stay cooped up indoors, productive folks are reaping the first sweet fruit of spring: sap. 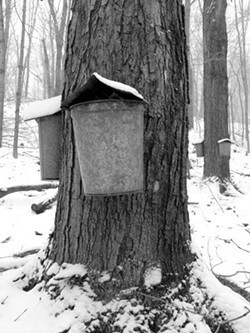 Although the maple species originated in China and Japan, maple sugaring is uniquely a North American phenomenon. It’s an age-old tradition that the Native Americans originally discovered and taught to European pioneers. Sinzibuckwud, the Algonquin word for maple sugar means “drawn from wood;” the Colonials referred to maple sugar as “Indian sugar.” Maple season was a festive time for the native tribes—the worst of winter was over and renewed life lay ahead. Every woman had her own “sugar hut” in the woods, near some abundance of maples, descended to her through her mother’s totem. 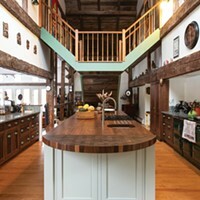 Children would frolic and dance while the sugar was being made, pouring hot maple syrup on the snow to make taffy. Many trees including the red maple, black birch, and butternut will give syrup from sap, however, the sugar maple—also known as “hard” or “rock” maple—gives us the sweetest and tastiest product. The process is an arduous labor of love. First there’s the business of tapping trees and hanging buckets. 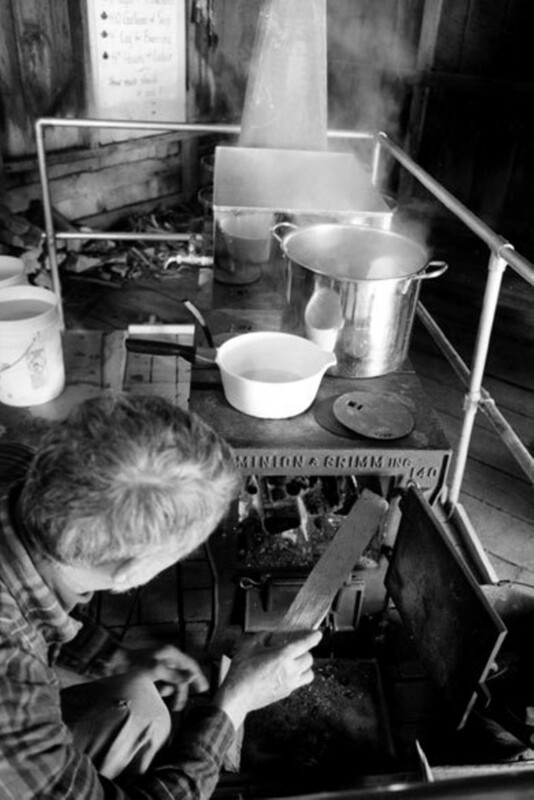 Then, collecting and transporting the sap from the “sugar bush” or maple grove to a “sugar shack” where the sap must be boiled off at high temperatures usually over a wood fire. Finally, the syrup must be drawn off, filtered, bottled, stirred into sugar, or made into other maple products. Tapping trees that Hill’s great-grandmother planted over 100 years ago on his family’s property in Rhinebeck, Huck and his friend John Corcoran began boiling syrup in a pan over an open fire. Corcoran then made a homemade “arch” (the stove, smokestack, and wide, flat evaporator pan custom-shaped for sugaring) which they used for many years. More recently they “graduated”—investing a few thousand dollars into purchasing a small two-by-six foot commercial evaporator and building a sugar shack to house it. Last season they yielded 29 gallons of finished syrup, the most they’ve ever produced. With the smokestack gushing, venison sausages roasting on the grill, and children scampering around the sap house—learning how to split firewood, helping to gather sap from the buckets, and begging a taste of syrup from the pan—the vision seemed a modern translation of the festive maple sugaring scenes of the pioneer and Native American days. Tim Neu at the Ashokan Field Campus uses sugaring as a tool to reconnect kids to the bounty of nature and to educate them on the history of the region. Ann and Dan Guenther run the sugar shack at Mohonk Mountain House to introduce visitors—often city dwellers—to the joys of sugaring. Unlike its corn syrup-based alternative, pure maple syrup is rich in niacin, B-vitamins, amino acids, potassium, calcium, magnesium, phosphorus, manganese, zinc, and iron. Maple sugaring since he was 11 years old, John Stockin opened up Lyonsville Sugarhouse, a maple syrup business, in 1985 with his wife Janine, who is in charge of bottling and producing their maple products year round. “There’s definitely something true about what they call ‘maple fever’—you have to be an idiot to do it. But once you catch it, nothing can get you out of it,” Stockin admits. With 3,800 taps, Lyonsville is the largest commercial operation in Ulster County. (The largest operation in New York runs about 20,000 taps; in 2003, New York produced 210,000 gallons of syrup, making it the fourth-largest producer of maple syrup in the world, behind Canada, Vermont, and Maine.) Lyonsville’s taps are distributed over five nearby “sugar bushes,” covering a total of about 76 acres of land and gathering between 40,000 and 50,000 gallons of sap per year to make approximately 1,000 gallons of syrup. John and Janine plan to add 500 taps a year until they reach 10,000 taps. On this scale, the typical backyard system of collecting sap in aluminum buckets would be impossible. Lyonsville, like most commercial operations, uses gravity-fed and vacuum-pumped sap lines—food-grade blue plastic piping (the color utilizes uv rays to kill bacteria)—to collect the maple sap. Hundreds of gallons of sap are collected and held in large metal storage tanks. At peak “run”, the tanks must be emptied at least every two hours. John then transports the sap by truck to the sugar shack where he boils it down in a wood-fueled evaporator. Boiling off about 300 gallons of liquid an hour, the syrup is drawn off when it reaches 219ºF or a density of at least 66.7 percent sugar measured by a hydrometer. The amount of sap collected per season relies wholly on the weather and is predictably unpredictable. One only has six weeks to gather the tree’s sap before the tap hole begins to heal over. Ideally, days in the 40s and nights in the 20s seem to produce the strongest sap flow. Come maple season, however, sugar-makers are at the whim of Mother Nature—at times without work and on other days boiling and collecting long into the night. 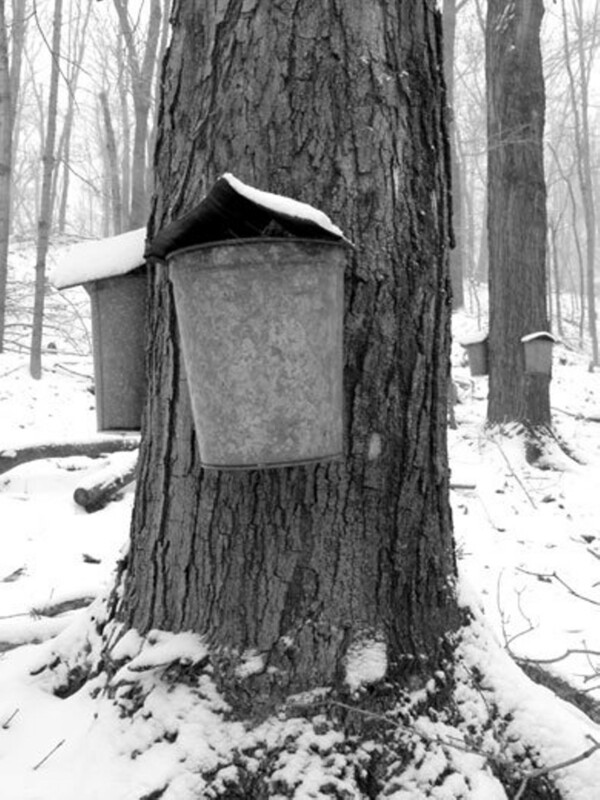 The art of maple sugaring requires a certain surrender to mystery and concord with nature. The weather and the character of the trees dictate everything from the yield of a season, the sugar content of its sap, down to the particular flavor of the maple syrup. Tim Neu gives all his guests a taste test at the Ashokan Field Campus Sap House. The pure maple syrup possesses a delicate, almost smoky flavor that comes up, then dissolves smoothly on the palate. Its cheaper imitation has a gummier texture and sticky, generic sweetness. Visiting backyard operations around the Hudson Valley, one soon realizes that pure maple syrup is something like liquid-gold—deeply coveted and intrinsically valuable. A fair-weather visitor is lucky to get away with even the smallest sample fresh from the pan. Only faithful labor, the generous provision of sap trees, or lifelong friendship earns one the pleasure of a whole bottle.